The Foreign Ministry condemns Russia's stance as a gross violation of the Consular Convention. The diplomatic missions of Ukraine's Ministry of Foreign Affairs in Russia for more than three months cannot obtain permission to meet with the prisoners Oleh Sentsov and Oleksandr Kolchenko. "The embassy and consular offices of Ukraine in the Russian Federation for a long time (2-3 months) have been expecting to receive from the Russian competent authorities of more than 20 permits to meet with our compatriots. In particular, the Russian side has not issued permission to visit the citizens of Ukraine O. Sentsov and O. Kolchenko, who are unlawfully convicted on trumped-up charges," the Department of Consular Service of the Foreign Ministry said as quoted by Interfax-Ukraine. The diplomats say the actions of the Russian side is a gross violation of Article 13 of the Consular Convention between Ukraine and the Russian Federation, providing for the right of consular officers to visit Ukrainian citizens in their places of detention in the Russian Federation. The ministry stressed that they will continue taking all the necessary steps regarding visiting Sentsov, Kolchenko and other Ukrainians, who are illegally held and convicted in the territory of the Russian Federation. 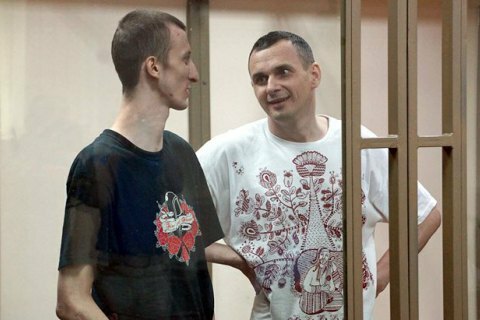 Last August, Russia's North Caucasus District Military Court found Sentsov and Kolchenko guilty of creating a terrorist cell in Crimea, committing two acts of terrorism, preparations for another act, attempted purchase of explosives and illegal possession of weapons. Oleh Sentsov was sentenced to 20 years in prison, and Oleksandr Kolchenko - to 10 years. In April, Sentsov and Kolchenko filed documents requesting extradition to Ukraine.